Mercedes-Benz M-Class PDF Workshop and Repair manuals, Wiring Diagrams, Parts Catalogue, Fault codes free download! Mercedes-Benz M-Class – a series of mid-size crossovers of the premium segment, produced in 1997 by the German automaker Mercedes-Benz. The car was designed specifically for the North American market and is the first product of the division Mercedes-Benz U.S. International in the USA. In the Mercedes-Benz product class hierarchy, the M / GLE model line is positioned between the GLC and GLS classes. Due to the fact that the symbol “M” was already patented by BMW for the high-performance models of the subsidiary of BMW M GmbH, the companies agreed that Mercedes-Benz reserves the right to designate the M-class crossover line, but in The models will use the symbols “ML”. Currently, the series includes three generations. The first, W163, was introduced in 1997 and opened a new market niche for the concern DaimlerChrysler. In 2005, it was replaced by the second generation, W164, which was released until 2011, when it was replaced in June by the third generation – W166. In total, for the period from 1997 to April 2011, the company’s clients were delivered 1 170 000 M-class cars. In 2015, together with restyling, the series was renamed the GLE-class in connection with the revision of the nomenclature of the company’s internal hierarchy of models. According to the new scheme, off-road vehicles use the basic designation “GL“, and then follows a short designation of the class in accordance with the accepted hierarchy. 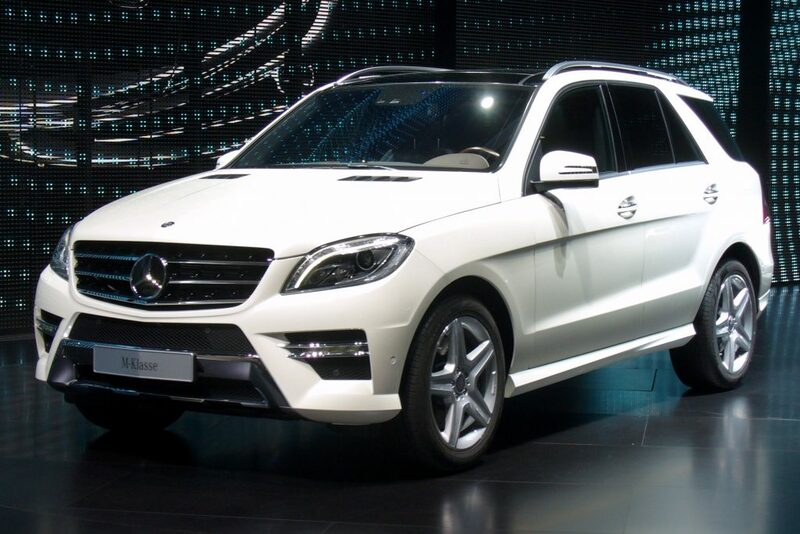 So cars “GLE” designate a series of medium-sized crossovers, equivalent to the E-class. M-class first generation in the face of the car Mercedes-Benz W163 was presented on February 19, 1997. A car was developed for the North American market and was produced at the factories of the DaimlerChrysler concern in Alabama. Official sales started in September of the same year. The car was a five-seat mid-size SUV with the option of installing a third row of seats (in this case, the number of seats increased to seven). The M-class became the first series of luxury off-road vehicles, equipped with the electronic stability control function. In addition, the cars were equipped with side and front airbags, which allowed him to earn high marks on crash tests. A key feature of the Mercedes-Benz W163 was the 4MATIC permanent four-wheel drive system, which redirected the torque to all the wheels through the front, middle and rear differentials. In 1998, the M-Class ML 320 won the “North American Car and Truck of the Year” nomination. In 2001, the car was restyled, resulting in new headlights and taillights, new alloy wheels, mirrors with integrated turn signals, 8 airbags, and various interior trim changes. At the same time, the ML 430 was replaced by the ML 500 with a 5.0-liter V8 engine. For Europe, a 4.0-liter V8 turbodiesel version of the ML 400 CDI is available. 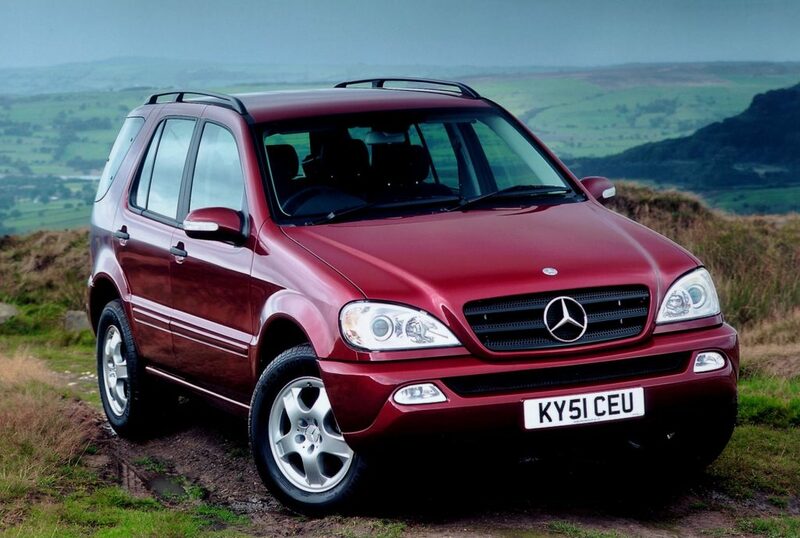 In 2002, the company Mercedes-Benz introduced the model ML 350, equipped with a 3.7-liter engine in a V6 configuration. In some markets, the ML 350 replaced the ML 320. In July 2002, on the basis of the M-class of the first generation (model ML 430), Papamobile was created. The company Volkswagen proposed to build a new car based on the model Touareg, but Benedict XVI decided to continue working with the company Mercedes-Benz. Concern DaimlerChrysler announced a new M-class back in December 2004. The debut of the W164 model took place at the North American International Auto Show in January 2005. In comparison with the first generation the car was completely modernized: it became 71 mm wider, 5 mm lower and 150 mm longer than its predecessor, and the wheelbase increased by 95 mm and amounted to 2,915 mm. Thanks to painstaking work on the body, the drag coefficient decreased from 0.40 in the first generation to 0.34. The quality of the construction was enhanced by the use of a fully galvanized body with additional corrosion protection with organic coating at certain points and large plastic panels installed on the bottom. The lineup consisted of gasoline ML350 (3.5 l V6, 272 hp) and ML500 (5.0 l V8, 306 hp) and turbodiesel 3.0 l V6 with CR system of the new generation (their debut took place together with the premiere of the new M-class), ML280 CDI (190 hp) and ML320 CDI (224 hp). In 2006, at the North American International Auto Show, the company introduced the high-performance modification ML63 AMG. The model was equipped with a 6.3-liter M156 engine with a capacity of 510 liters. from. (380 kW) and torque of 630 N · m. Production was organized in Affalterbach, Germany. In 2008, the model underwent restyling, which affected the external and internal appearance of the car, as well as a range of engines. The updated version of the car was introduced in March 2008 at the International Auto Show in New York. Changes in appearance touched the bumpers and front optics, the radiator grille (it was enlarged in size and equipped with chrome inserts along the edges). The rear of the body received a modified bumper with integrated reflectors and a reversing lamp, as well as tinted optics. Roof rails and large exterior mirrors were installed as standard equipment. In the cabin there was a new multifunction steering wheel with chrome trim in a design with four spokes, covered with leather. The door fittings were covered with artificial leather, and on request it was possible to install seats with four-level lumbar support. In addition, the M-Class was fitted as standard with the PreSafe Pre-Safe and Pre-Safe System and NeckPro special head restraints. A little later the company presented two special series – Edition 10 and Grand Edition, – with a special exterior and a car salon. In 2008 and 2009, models that use BlueTEC technology with urea injection for diesel power units were added to the series. 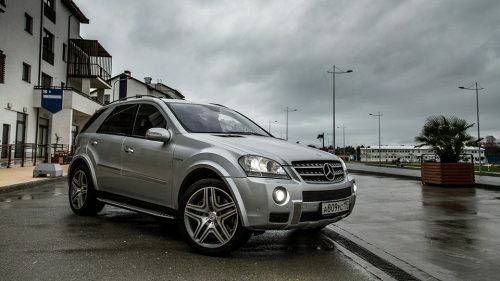 At the international motor show in New York in 2009, Mercedes-Benz introduced the new ML 450 Hybrid SUV, which was announced on April 8 of the same year. The car was equipped with several engines: one classic engine and two electric motors built into the gearbox body and performing different tasks. The new model consumed almost 50% less fuel than ML 550. At the same time, the total power reached 335 liters. from. (250 kW), and the torque was 517 N · m.
Production of the second generation M-class was completed in June 2011, and replaced by Mercedes-Benz W166 series cars. The development of replacement for the second generation M-class began in 2006 and lasted for 5 years. In 2008, the company’s executive board approved the final version of the design from Emil Burka, which was patented on the domestic market on December 16 of the same year (a patent application in the United States was filed June 15, 2009). June 8, 2011 in Stuttgart, the third generation Mercedes-Benz W166 crossover was introduced. The new features of the car include the updated seven-speed automatic transmission 7G-Tronic Plus, optional adaptive cruise control (Distronic Plus), an active lane departure warning system, and a pneumatic suspension with adjustable height (Airmatic). In addition, the technology ACTIVE CURVE SYSTEM with active stabilizers of lateral stability for compensation of a roll of a body has been presented. The W166 was the last product of the joint venture between Daimler AG and Chrysler (DaimlerChrysler). The concern has developed a basic platform and technology, taking advantage of the stable sales of Chrysler and R & D SUVs in the domestic market of the United States. Chrysler continued to use the same platform for the production of cars Jeep Grand Cherokee (WK2) and Dodge Durango. However, in connection with the reform of the concern, crossovers vary greatly in terms of interior and body design, as well as the choice of engines and transmissions. For the 2013 model year, an optional On & Off Road Package is available, which includes a two-speed distribution box from Magna International, underbody protection plates, a variable suspension program with 6 modes and other functions and technologies. The M-class car won first place in the category “Luxury Crossover SUV” and was named the most ideal vehicle for Americans. This decision was made based on research conducted in California by the consulting firm AutoPacific. In early 2009, India created production facilities for the production of M-class off-road vehicles. In the autumn of the same year, he opened a factory in the city of West Java, Indonesia. In December 2012, a new car bomb was assembled and delivered. 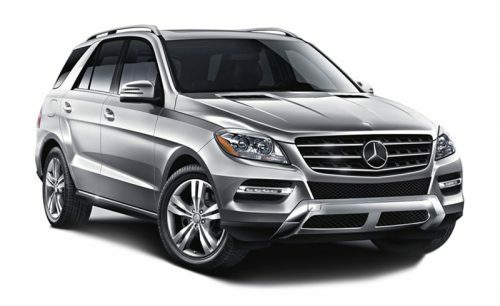 In the spring of 2015, the company Mercedes-Benz introduced the updated M-class, renaming the series in the GLE-class. In addition, the company first introduced two modifications of the M-class body: a classic SUV (W166) and a coupe (C292), which was presented in January of the same year at the North American International Auto Show. In the model range of the class there were also changes: the GLE 500 e became the first hybrid of the series combining the internal combustion engine V6 with a capacity of 333 liters. from. with an electric motor generating 116 horsepower. The first 19 units were delivered to buyers from the USA in June 2016. The restyling M-class range includes gasoline ML 350 BlueEFFICIENCY 4MATIC (V6, 306 hp), ML 400 4MATIC (V6, 333 hp), ML 550 4MATIC (V8, 408 hp), ML 63 AMG (V8, 525 hp), as well as diesel ML 250 BlueTEC 4MATIC (I4 biturbo, 204 hp) and ML 350 BlueTEC 4MATIC (V6 turbo, 258 hp). The W166 car went through a lot of crash tests, including the EuroNCAP, the US National Traffic Safety Administration and the Insurance Institute for Highway Safety, where it received the highest marks.